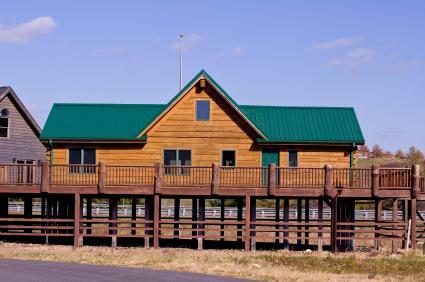 A well-chosen deck railing can enhance the appearance of your deck in addition to preventing falls and other accidents. While many homeowners are familiar with standard wood railings, other types of railings may be better suited for your deck. 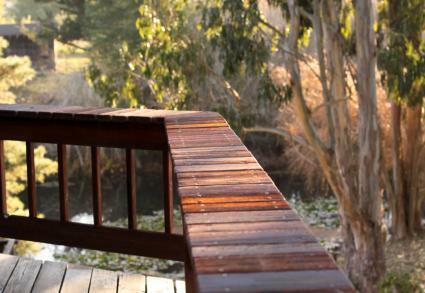 Deck railings are available in a wide variety of materials to complement the enormous range of deck designs offered. It is important to choose a railing that will be able to withstand the climate in your area as well as meet your aesthetic requirements. Wood is the most popular type of railing material. Inexpensive and readily available, railings can range from modern to ornate styles, and wood is a favorite for do-it-yourself enthusiasts. 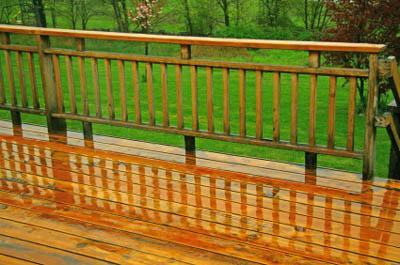 You can also paint or stain a wood railing to perfectly match your existing deck stain or paint. Unfortunately, wood railings require regular upkeep to prevent rot and other damage. Plan on painting or sealing a wood railing every three to five years. You should also check each year for rot and replace any areas that may be affected. This is particularly important in wet climates, where the lifespan of a wood railing can be greatly reduced. Ranging from ornate cast iron panels to simple wrought iron pieces, metal railings can be an excellent choice for many types of decks. While some types of metal railing may require regular painting and upkeep, other types will only need to be cleaned occasionally. If you live near the beach, keep in mind any reactions your metal railings might have with the sand and plan your maintenance accordingly. Composite railings are popular with homeowners who want the appearance of wood without the maintenance concerns. Many home improvement centers sell composite railing kits that can be quickly assembled and installed by the amateur. Once the composite railing is in place it does not have to be painted or monitored for rot. Instead, a yearly pressure washing should keep the railing in excellent shape. Composite railings are specially treated to resist fading, but cannot be repainted. This is particularly problematic if you repaint your house or deck a different color. For this reason it is best to choose a neutral color for your railing. You should also be aware that composite railings are available in limited colors. A glass railing can be a stunning addition to a modern or contemporary home. Often used in conjunction with a metal frame, glass railings will require professional installation. Most glass railings are available in a few standard sizes. If your deck falls outside of these parameters you may have to order custom glass panels. Glass railings should be cleaned regularly to retain their sleek appearance. If you live near a beach, sand may etch the glass over time. It is also important to keep furniture and other items that may scratch the glass away from the railing. Metal cables are inexpensive and require little maintenance once installed. There are a wide variety of cable styles and configurations that can be used with both metal and glass posts. A professional installation is recommended to tighten and test the cable configurations. While there are many styles to choose from, there are two common designs: horizontal and vertical. A horizontal design does not have traditional balusters. Instead, two to three rails run horizontal to the deck attached to the rail posts at regular intervals. The overall look is like a fence instead of a banister. This style works well in modern and transitional style homes. Most likely the rails are made of metal or cables, which help to preserve the view beyond while keeping the function of the deck. With a vertical rail design, the balusters run up and down between the rails, similar to a banister on a balcony or set of stairs. This is usually the most common design although the style of balusters can be different. Vertical balusters can fit any style of home from traditional to modern, depending on the material and style used. The balusters may need to be spaced fairly close together to meet most building codes, so this needs to be taken into consideration when selecting the material for the design. 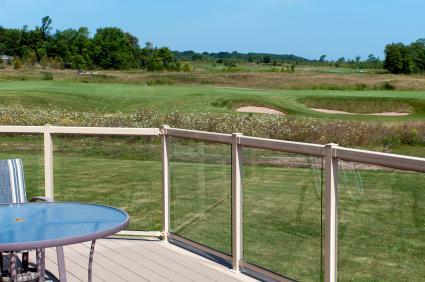 With the numerous options available in materials for your deck railing, the style options are abundant. When it comes time to choose the design of your deck railing, take the following points into consideration. Form must always follow function, and this is especially true with a deck railing. Make sure your deck railing meets safety guidelines for your area by checking with your town hall for spacing and material requirements first. Then consider your area. If you live in an area with heavy snowfall, keep the bottom of the railings open. This allows you to push the snow off the deck without having to lift it over the railings. Finally, consider what you plan to use the deck for. 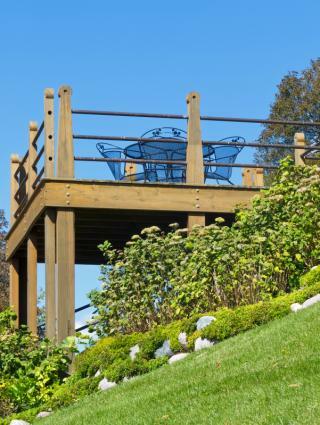 If you plan on entertaining a lot, consider a deck railing that has a bench seat worked into the design. Or consider widening the top of the railing to allow guests the option of balancing a drink or a full plate on top. If your deck overlooks a fantastic view, you may want to consider using deck railings that help convey, rather than conceal, the yard beyond. 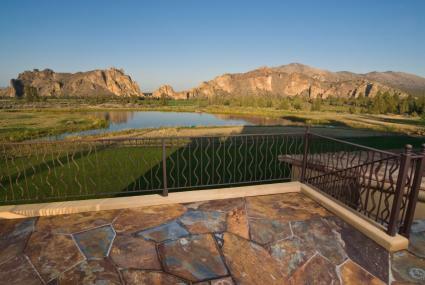 Thin metal railings, cables and glass railings all vanish from the eye when you are focused on the view beyond them. Heavy wood or stone railings, however, will quickly block out the sites. Match your deck railings to any decorative moldings or trim on the house. Look to your decking material for inspiration. A random, stone paver deck is complemented by artistic metal railings, but can clash with heavy wood rails for example. Keep the age of your home in mind. Use materials and designs that were in keeping with the house when it was built, such as ornamental stone railings with Victorian style homes. Alternate each section between the posts. One section could have vertical balusters and the next section could have etched glass or a special carving. Use latticework instead of balusters. This could allow plants to grow up the sides, giving your deck a very lush appearance. Use a design from a different culture such as a Japanese garden. The style is very simple, clean and will give your deck a very different look from the neighbors. Remember that for proper support, attach rail posts to the deck frame, not the deck surface. Even if you already know how to build a deck, the code restrictions and local laws that are applicable to only the deck railing may surprise you. Check with your local government before installing any type of railing. You may be required to obtain a permit or get city approval for your plans. Most building codes applicable to deck railings are intended to prevent falls or injuries. Not only are there height requirements, but there are also baluster spacing restrictions. These restrictions are intended to prevent a small child from getting his head stuck in between two balusters. These restrictions can be updated often, so if you are updating your deck, double check the regulations before you proceed to make sure they haven't changed. While some deck railings may last longer than others, it is important to conduct regular checks of your entire deck. Rot, loose fasteners, and other hazards may not be readily apparent, but could be dangerous. Consider hiring a professional to do a thorough check of your railing and deck every few years. A licensed inspector should be able to offer tips to conduct your own examination as well as point out any potential problems.